Whether it's the worst snowstorm of the century or a quick trip to the airport for a romantic getaway, YellowCabCo. is on the road whenever you are, anytime you need us. YellowCabCo. has provided the Greater Des Moines community and metro with reliable, experienced, and professional transportation for nearly 100 years. 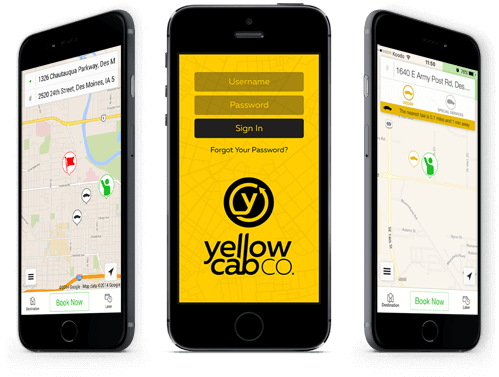 When you need to quickly and efficiently travel around the Greater Des Moines Metro area or Central Iowa, you can count on YellowCabCo. Our updated Des Moines cabs are available 24/7/365 with safe and courteous drivers familiar with the area. Our customers can call, book online, or download our mobile app to get a ride where they need to go. Using state-of-the-art GPS technology, your YellowCabCo. app offers a smart and efficient solution for a more tech-savvy client base that is looking to get transportation solutions on the go. Our app is available online at either the App Store or Google Play and is free to download and use whenever you want. Our team is currently looking for drivers to work either part-time or full-time as ambassadors for the Greater Des Moines Metro area. We've Created Three Advertising Solutions For Increasing Brand Awareness. Yellow Cab | Trans Iowa, L.C.